Hi we're about to buy a new 08 MC. I was wondering if you could list the best mods you have done to your car. Also, what mods weren't worth it? If you haven't done mods, What are the best options you ordered? What're the worst? I'm researching Nav and blue tooth options now. We want the MC for the gas mileage as a DD. I think we are going to order: Lightning blue or black, white roof, 6M. cold weather, all season tires for winter. checkerboard cloth sport seats, piano black, cream colorline, chrome gauges, chrome mirrors, anthracite headliner, garage mirror, MF steering wheel, aftermarket cream striped floor mats, arm rest. Probably some aftermaket wheels and tires for summer. I got a MC too and dressed it up with window tinting, JCW aero kit, nice wheels, Chrome gas cap (easy swap-out) and new side scuttles. Looks like a MCS, but averages 35 mpg. Right now one of the best things i've done was gotten my windows tinted and installed h&r lowering springs. they give the MC a sleeker look and gets rid of the SUV look. i am looking into getting a 19mm rear sway bar. I want to do those springs too. Did you do it yourself? How did the ride change? What about issues with re-alignment Corin? Also, I saw your post on scuttles. Any (including S) will work and you can change those in a couple of minutes. Super easy. i was going to do my springs myself with aid from my friend (who is also a car junkie) but my parents insisted that i got them professionally installed. I got it done by Danny down at minicorsa in so-cal if you are near there. i stayed and watched the install and glad i didn't do it myself. its a lot easier if you have a lift, but it can be done. the ride is great. it handles the corners well, i take it out to the canyons every sunday with my friend in his 350z. and gives it a nice look. the only problems i have with them is getting in and out of school but that's what's going to happen when you lower it and when i go through some banked curves in the canyon the mud flaps on the underside of the car bottom out. I think the simplest, cheapest, most effective mode is blacking out the beltline. It brings the roof area down just enough to affect the overall balance of the car. You should consider adding a turbo. My first mod's going to be the rear sway bar. 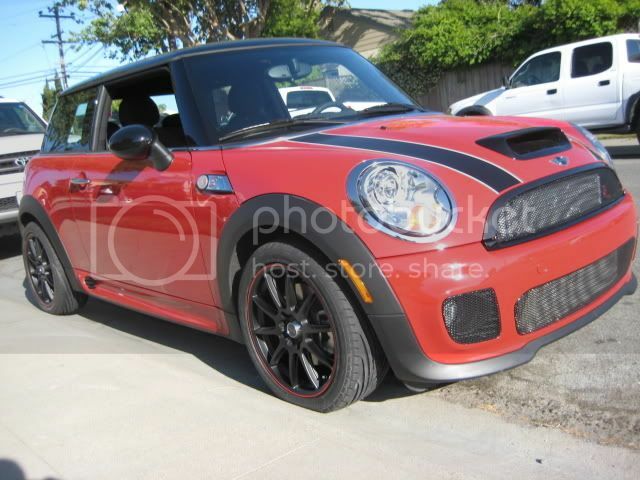 My Mini came with really nice wheels already and some pretty decent tires. Plus the aero grille. Not sure after that. I don't want to lower it... I can hardly get in and out of my driveway as it is (it's steep). Last edited by KittyMini; 05-22-2008 at 07:52 AM. Now I waiting for CAI, I order forge carbon induction, actually it's for cooper s but I will adjust it to my cooper R56...I will let u know the result later.. I just don't know how it works yet. A sway bar upgrade was money well spent. Went to 17" wheels and tires. Much more fun to drive, but be prepared for a harsh ride. Excellent idea on tinted windows. I did the same and totally agree. The sport seats are more comfortable than the base leatherette seats. Got the multifunction steering wheel and am very pleased with it. I doubt that it's a "mod" -- but the most useful thing I've added to my new MCS is the Light n Sound plastic thingy on the top of the windscreen that lets me see overhead traffic lights when pulled up close. Light n Sound plastic thingy on the top of the windscreen that lets me see overhead traffic lights when pulled up close. thank, Vaper for picking up the ball...... I wasn't paying attention and didn't mean to ignore Mininightflame's question about the Light n Sight. I just figured that you got busy, no harm. although i own an MCS, i think a GREAT mod would be the m7 grill. it adds that really nice aggressive look to your car. 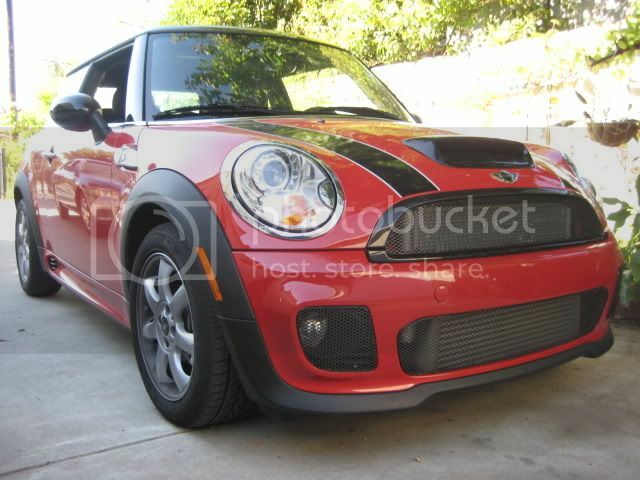 it gives it a different look compared to the other minis you'll see on the streets. since you wont have a turbo, may i suggest the light bar that alta sells? if i had an MC i would get that. for performance, or should i say suspension mod, i think one of the best mods and EXTREMELY affordable, would be a sway bar. from what i read here on the forums, theres a night and day difference when you have it on. it's a $330 placebo that "corrects" a "problem" that only the purchasers of it seem to have. Save your money and get a real tune. On topic - the Glove Box Tidy is a cheap, simple mod that makes the glovebox much more usable. Adding a water temp gauge is also a good idea. As for options - the nav and bluetooth you're considering have proven to be invaluable to me. I love how well everything integrates.